Dorset health chiefs are considering banning fast food takeaways from within a mile of schools in Poole in a bid to tackle adult obesity. The initiative was drawn up by Poole and Bournemouth councils and NHS Bournemouth and Poole as part of their Adult Obesity Delivery Plan 2010-2015. 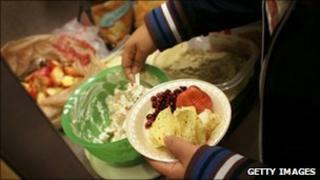 Their move comes as recent research suggests more than a quarter of adults in Poole are obese. Public health consultant Lindley Owen described the findings as "worrying". Mr Lindley, who consults for NHS Bournemouth and Poole, added: "Advertisements for fast-food are relentless - we have got a big struggle [on our hands]." If the plan is given the go-ahead, planning applications for fast food outlets near schools from chains such as Pizza Hut and McDonalds would not be approved. A spokesperson for Pizza Hut told BBC News: "We're always happy to talk with the local council about any new policies they may have as we take our responsibility to public health seriously. "This is why we do not market directly to children and in recent years we have also reduced salt, sugar, fat and saturated fat, as well as removing all added trans fats, across our entire menu." Encouraging local food production, regular exercise and early interventions by GPs are other initiatives included in the action plan. The figures on adult obesity in the South West region were collated by the Association of Public Health Observatories. Research suggests children who are obese or overweight are more likely to suffer from poor health later in life, with a greater risk of developing heart disease, diabetes and some forms of cancer. Mr Owen said: "People don't walk because the car is more convenient and they don't cycle because the car is less effort. "If you do not expend the calories they have nowhere else to go."